Introduction. People are looking for relationships where they can find love, meaning, security and joy. God designed families—both natural and spiritual—and homes for this purpose. As part of his plan he intends us to have a home on earth and a home after death. Theme. God designed us for a relationship with him and others. Learning the Content of the Gospel. It is essential to take three hours to study chapter three and the amplified diagram, including reading thoughtfully the Bible passages. Practice. You are now ready to fill in the diagram with the five points of the gospel. You should fill in one point at a time, following the simplified version. Keep practicing this on different sheets of paper until you can do it from memory. As you fill in each point, you can also draw the two signs on the road and fill in the words on the bridge, which form a cross. Sharing How to “Come Home”. After reviewing the amplified version and again looking up the Bible passages, you are ready to share the simplified version of how to “come home” with a Christian friend, drawing the diagram and briefly explaining the five points, main point, Bible verse and illustration under each of the five points. Be sure to stop after point 3 and ask if they sense any personal concern. Ascertain if they see the dilemma. Your partner can either say something like “I think a God of love would just overlook my failures” or “I’m pretty happy with my life right now; I don’t see a need for religion.” You have to decide how to answer this! (Hint: Point 1 is the basis for all we’ve said. God made you, and he is not only a love-giver; he has made road rules, and we are responsible to him—a personal God.) Then ask if you can continue the last two points, for this may clarify things. Reverse roles. Then give each other feedback on what was clear and what wasn’t. Objective. The objective of practicing the diagram is to help you, as a Christian, get a grip on the content of the good news (gospel). By so doing, you are able to listen to the person you are talking with and bring in various points of the gospel as appropriate. Many times simply communicating what God is like (point 1) is a successful conversation. By knowing the diagram, you can start at any point and move backward or forward as needed. However, it is best to ask for the opportunity to give this overview at some point. This diagram is a grid on which to organize the truth that God says is so important for everyone to know. Be sure you are thoroughly familiar with the amplified version so you can draw on this background when in conversations. Most people are not convicted the first time they hear this story. Your job is to plant and water the seed of God’s Word into the conscience and heart of people. The Holy Spirit may use the truth joined with your friendliness and love to give them faith and a new birth according to his timetable. Sometimes people will find it helpful if you ask them, “What objections/problems do you have with Jesus Christ?” “Can you explain to me what the first three points are saying?” or “What do you think is keeping you from becoming a follower of Jesus?” These questions may allow you to clear up their misunderstandings, bad examples of other Christians or churches and so on—or just to listen to them! The danger is this may get you off on a tangent, so with the “Come Home” diagram in mind, keep coming back to it. What’s really fun is to say, “Can I tell you a story?” Then tell them about Paul walking into Athens and talking to some university professors in Acts 17, or about the two lost sons in Luke 15 and so on. Practice reading the five key Bible passages one paragraph at a time, explaining them to a Christian friend. This Road to Home gives you a visual framework on which to pin the five gospel points. Introducing the Diagram. With someone you’ve talked with before, simply say, “Many people have found it helpful to see an overview of the main theme of the Bible. Can I show that to you, and then you can point out which part you don’t understand, disagree with or find helpful?” Keep practicing the diagram and the three topics under each point (#4 has four). Then, as you talk to someone, you will find drawing it helps them to follow the story. Or, you may visualize the diagram mentally as you carry on a conversation. You may not get the opportunity to share the simplified version of “Come Home” very often. But knowing this diagram will help you realize when you are not talking about the gospel and only talking around the fringe—as in so many of our conversations. You can then be reminded, as you think back over a conversation, to next time bring in some of these truths. Most important, knowing “Come Home” prepares you for a lifetime of lifestyle witnessing. The following are two versions of the “Come Home” diagram—an amplified version for study and a simplified version for sharing. Each set of pages, with a bit of ingenuity, can be photocopied and folded into handy 5″ x 8″ booklets. The simplified version is the easiest: just photocopy pages 281 and 282 back to back and fold in half with the diagram in the middle. The text of this version can be enlarged by about 33 percent and still fit ordinary paper size for easier reading. In each case you may want to cut pages from the book for easier photocopying. The amplified version can be copied on two 8 1/2″ x 11″ sheets and folded in half, leaving any blank half pages for notes: staple if you wish. Point: God has rights over you; you are accountable. Illustration: The inventor has patent rights and instruction book. Illustration: Jumping over a pole 100 feet high. 2. Sin separates you from God. 3. Sin must be punished for God is just. Point: We are self-centered and separated from God. Question: Do you admit you are a sinner? 1. God provides his Son as a bridge. 2. Jesus perfectly obeys God’s rules (righteousness). 3. Jesus is sin-bearer (takes our penalty). 4. Jesus lives and offers himself to us (righteousness-giver). Point: Jesus is sinner’s substitute/reconciler/liberator. He is the only Lord and Savior. Point: Receive Christ as your Savior and Lord. Do You Know the Bible’s Main Theme? Are you able to express the main theme of the Bible, the most influential book of all literature? Most people, Christian or not, cannot! What is this theme called the “gospel”? This booklet is a tool to help you grasp the essentials of the gospel. Whether you are a seeker of Christ or secure in having found him, you need to get the facts straight. Having an outline of a God-centered gospel in your mind will free you to listen and be more natural as you tell the truth to others. You can concentrate on what they are saying and bring in any of the five truths of the gospel as appropriate. However, truths 1, 2 and 3 give the foundation for 4 and 5 and normally are needed first to show why Christ is necessary. Therefore, ask for a non-Christian at some point to hold their questions and listen for fifteen minutes as you give an overview of all five truths which as the framework for your answers can really help them understand. Or, at least go over truths 1-3. This amplified version of the gospel diagram “Come Home” is intended for detailed study by those who wish to have a better knowledge of the content of a God-centered gospel. Christianity is both something to be believed and Someone to be received. To impersonally present these truths would be to contradict the nature of the gospel. Prayer and a personal relationship showing love are all-important. You can follow a printed simplified version for sharing, although a conversation in which you draw the diagram is best. Live the gospel, but words are necessary, so use them. Evangelism is a way to glorify God by knowing the gospel well, living it well and telling it well. These Scriptures provide incentive and direction for your prayers for others. If you’re praying in a group, assign each person one or two passages as a basis for their prayer: Matthew 11:25-30; Luke 15; 16:19-31; John 4:1-42, 10:1-18; Acts 4:24-31; 5:27-32; 17:27-34; 26:19-29; Romans 10:1-4, 9-21; 1 Corinthians 1:18–2:16; 2 Corinthians 2:14-17; 4:1-18; 5:11-21; Ephesians 6:10-20; 1 Thessalonians 1:2–2:13; 2 Timothy 1:6-10; 4:1-5; Revelation 20:11–21:5; 22:17. People for Whom I Will Pray and Witness: 1. 3. 5. 2. 4. 6. Reprinted from Tell the Truth ©2012 by Will Metzger with permission from InterVarsity Press, Downers Grove, Illinois. This helpful training manual for God-centered evangelism in book form is appropriate for individual or group study. It is available through Christian bookstores. Adapted from Will Metzger. 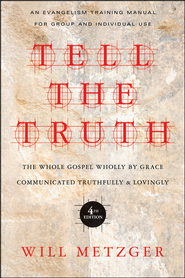 Tell the Truth: The Whole Gospel Wholly by Grace Communicated Truthfully & Lovingly. Downers Grove, IL. : InterVarsity Press, 2013. 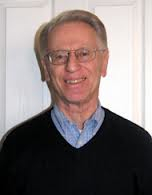 Will Metzger has been a campus minister at the University of Delaware since 1965, where he serves with InterVarsity Christian Fellowship and Christian InterAction (a church and campus connection). His evangelism ministry has taken him to every continent, and he has witnessed to people from varied nationalities both on campus and through a church that he pastored.